Many small cysts on the ovary (12 or more) or increased ovarian size. 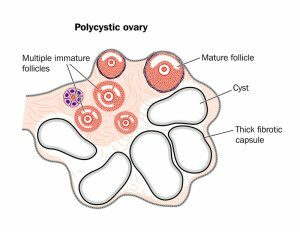 For reasons not completely understood PCOS patients often ovulate infrequently or not at all which explains why they can have abnormal menstrual cycles. When ovulation does not occur, an egg is not available causing infertility. Without ovulation, progesterone is not produced by the ovary; this often leads to irregular, infrequent vaginal bleeding. Importantly, women need to menstruate regularly if they are not pregnant, or using birth control pills or progesterone to prevent endometrial hyperplasia (pre-cancer) and endometrial cancer. Because about 75% of women have an excess of functional androgens (for example, testosterone) they often have more coarse (thick and dark) hair in places such as above the lip, chin, sideburns, back, belly button, and breasts. Androgens also contribute to acne.